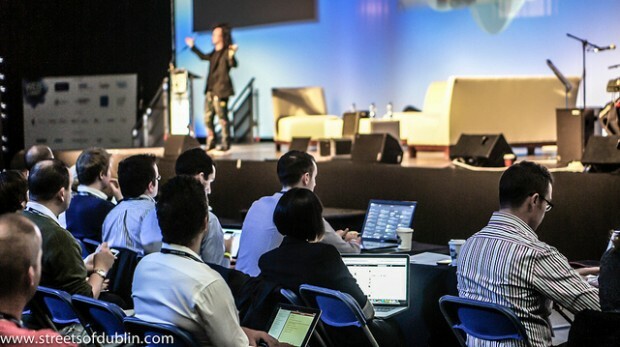 Attendees of the Web Summit enjoy a conference. Photo by William Murphy. This summer, I was able to celebrate something absolutely amazing with my team. My company secured a record-setting investment of $165 million, letting us expand our position as the world’s leading social relationship platform. But it wasn’t an easy journey. In the fall of 2009, I was a 34-year-old entrepreneur running a small digital marketing agency called Invoke and we had just launched a useful little tool called HootSuite, which let users manage multiple social media accounts from one place. Things looked promising: Hundreds of thousands of people around the world had signed on, all driven by word of mouth. But as 7 members of our 21-person team were now working on a zero-revenue product, I knew that we were going to need to bring in investment to keep the dream alive. Desperate to keep the lights on, we were relieved when we finally attracted interest from some major VCs. We started with an initial round of funding in 2009 and, as the company grew, we attracted additional investment. From the outside, all of this might look like a slow and steady climb, but the reality was anything but. Attracting the right kind of investors and developing healthy relationships with them requires patience and vision. Are they personally likeable? If there’s friction before you commit, you can bet it’s only going to get worse once the ink has dried. Please be sure to do your due diligence. The Funded offers user-generated ratings on thousands of investors and is a good place to start. Investigate the investor’s portfolio companies and reach out to them. How well have they been treated (or mistreated)? Are your investors looking to get rich quick and milk your company for all its worth, or are they in for the long haul? Keep in mind that once you’ve locked down a deal with one investor, it may be difficult to go out and pursue additional funding when your company needs it. Even if you get great offers down the road, if your investor isn’t on board with your vision – for whatever reason – then your growth may be compromised. AngelList, for example, is a great place to connect with angel investors and put together an angel round with people you actually like. The service helps promising early-stage startups get a shot at connecting with qualified investors. Since AngelList launched in 2010, it’s produced some remarkable results. Last year for instance, Rally.org (a startup that helps people raise money for causes), secured an impressive $7.9 million in a round of Series A funding–all via the funding platform. It’s worth pointing out that the best way to control your destiny is to get to profitability as soon as possible. You’ll be less reliant on outside sources for funding and in a better position to build the business you dream of. Please play nice. Working with a difficult investor can be a nightmare, but it really shouldn’t be that way. Investors, make your entrepreneurs feel valued. After all, you’re coaches, not pimps. At the end of the day, money saved by arguing over legal bills and bankers fees probably isn’t worth the cost to your relationships and future prospects.